While visiting Colorado recently, I had the opportunity to explore Rocky Mountain National Park, and it was largely a vertical experience. Within its borders are 72 named peaks that reach above 12,000 feet in elevation. Traveling from the Beaver Meadow Visitor Center – elevation 7,840 feet – to the Alpine Visitor Center – elevation 11,796 feet – the drop in temperature was anything but subtle. The reason for air being cooler at higher elevations is twofold. First, the sun’s rays heat the Earth’s surface, which in turn, radiates that warmth into the atmosphere. As you climb in altitude, there is less surface area of land available to heat the air. Second, as air rises, it expands and cools. This is because air density and pressure aloft are lower than at the surface. 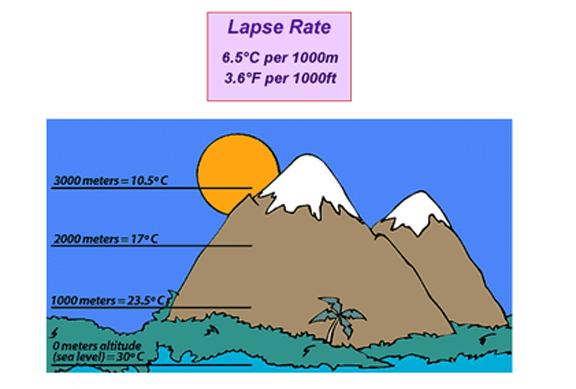 The exact rate at which the temperature decreases with height – the environmental lapse rate – varies with location and daily conditions. On average, however, for every 1000 feet gained in elevation, the temperature drops by about 3.6°F. This entry was posted in weather and tagged co, definitions, national parks, temperature, travel by Melissa Fleming. Bookmark the permalink.